While in Las Vegas last week for the Consumer Electronics Show, I decided to avoid the clogged convention center WiFi (and just about unusable AT&T 3G/2G/what exactly do 5 bars mean anyway?) 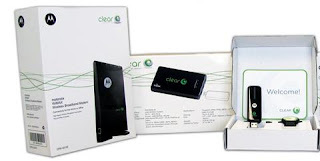 with a daily rental of a Clearwire WiMAX Modem. I logged my connection speeds throughout the week at various locations; my hotel, a Starbucks ~0.5 miles away, the Pearl Theater at the Palms Hotel during the AT&T Developer Summit, and at the Las Vegas Convention Center. Results varied of course, but overall coverage was very impressive and download speeds were better than the 2-6MBPS download speeds I have seen reported for Clearwire's initial rollout in Portland. With some LTE advocates claiming that the 2.5GHz WiMAX carrier would be inferior for in-building use, I was especially impressed that I had a reasonable connection inside the subterranean Pearl Theater. The upload speed was another story however, as I was never able to hit even 1 MBPS. 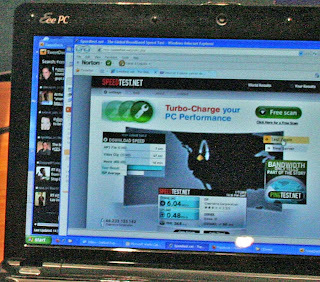 While at the Convention Center, I noticed that Motorola was also demonstrating Clearwire WiMAX on a laptop computer in their exhibit. The demonstrator kindly allowed me to pull out my netbook for a side-by-side test. He was even running the same test from speedtest.net that I was using. 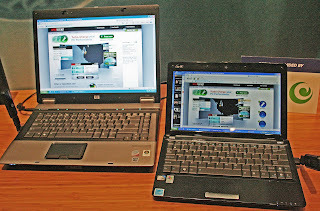 My Asus 1101 netbook is on the right in the picture below, and Motorola's HP netbook is on the left. 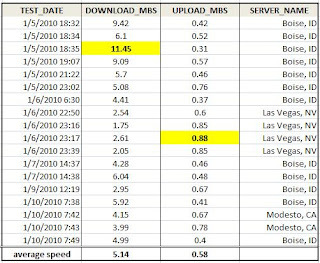 The result of the test is a mystery, because our download speeds were well within the variation I had seen, but the upload speeds weren't even close. 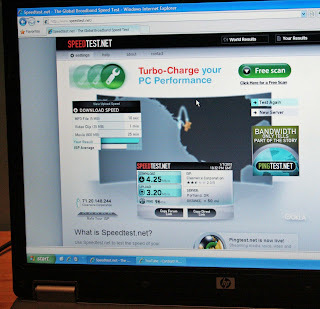 I noticed after the test that Motorola was using a Clearwire server in Portland, which Speedtest would not have chosen on its own. I did ask the demonstrator if they had a special channel of some sort for the demo, and he did not think that they did. So.. what's the explanation? I did have problems with the install, and had to download a generic wireless USB driver to get the modem to work. That seems unlikely to be the cause to me. My inquiries to Clearwire have not been answered as of the date of this writing, so check back later. I will add their response to this post as soon as I receive it. I read your profile and found it quite interesting. I am a PhD student at Arizona State University in the electrical engineering department with specialization in mixed signal circuits for communication applications. I am working to spice up(find motivation for my work on analog to digital converters). I come from a telecommunications and software engineering background and I am looking to attack on problems related to ADC's. What are the problems that I can target and with what perspective may I approach ADC's. There are many angles you could take regarding ADC design problems: speed/power trade-offs are always an issue. Programmability to adjust for PVT variations, and auto-calibration are also issues. If you want to contact me through LinkedIn, we can exchange ideas more easily in email.